Are you searching for a Tower Clock Company in Indianapolis Indiana? 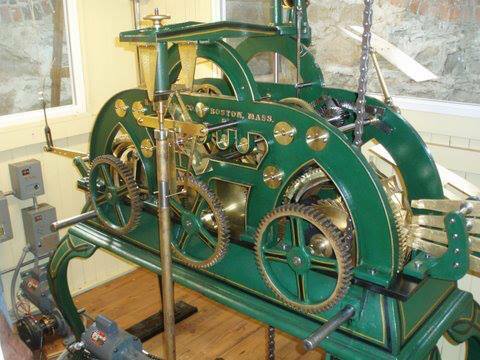 Smith Bell and Clock Service provides nationwide Tower Clock Company Provisioning and service to our clients in Indianapolis as well as clients all over the USA. We specialize in creating or renovating existing clock towers. Specifically, E. Howard and Seth Thomas model tower clocks were a popular choice by many old courthouse clock and bell towers. These historic time pieces keep very accurate time when taken care of and have proven themselves over and over again to be a time piece that lasts! Historic Restoration again is our specialty. From recreating the artwork, down to the name plate, we’ve got you covered. We can restore these movements to their original pendulum swung mechanism with gravity or deadbeat escapements, or do an electric renovation. We also can custom make wooden, steel or aluminum dials, hands, or numerals. Cast Iron skeleton dials is another popular clock dial that we have the ability to recreate or refurbish with sandblasting and powdercoating. We also use the finest material in recreating the dial using quality 1/2″ translucent acrylic whenever possible. LED is the cure to create a beautiful masterpiece that looks great at night. We also have different options for backlighting the hands with LED’s. Our new and or renovated equipment comes with an unprecedented warranty of 10 years provided we’re able to do perpetual maintenance on the mechanism during that time. If you have been searching for a tower clock company that is experienced and knowledgeable, your search ends here. Call us today at 317-847-4092.